Now we love darts here at Brash Games towers, and it’s nice to see publishers and developers taking an interest in what is, essentially, a European sport (yes, it is recognised as a sport, but probably in much the same way as Pete Best is recognised as a woman – begrudgingly and rather erroneously) that isn’t ‘saccer’. The problem comes when you realise that the quality of the production values of a sports (stop chuckling, you!) franchise is directly related to the global turnover of said sport. Thus, PDC World Championship Darts Pro Tour sits somewhere between rounders and lacrosse. My point here is that the biggest issue you’re going to have with Pro Tour is that it’s such a budget title. Once you realise that the RRP is forty-odd quid, the problem becomes an unassailable one. It’s not that it’s a particularly bad game, and certainly the control mechanics are sensible and require a degree of thought and dexterity, but everything else is, well… toilet. Then, of course, you have to get over the fact that it’s a darts game. This is not easy thing, because playing darts is, frankly, boring. Even the most minor competitions require a degree of mental fortitude reserved for military torture-resistance training. These are long games, and the deeper into the game you get, the longer the matches. There’s nothing epic about them either. Each player has a tiny handful of animations and the announcer’s constant drivel will have you muting the TV within hours. In short, this is not an enjoyable game, certainly in single player, where the length of the matches is prohibitive to you playing a single tournament in a sitting. Multiplayer, things take a slightly more reasonable turn, as you can customise your tourney exactly as you want it. While this doesn’t take away from the fact that this is darts at its most basic, it at least allows you to recreate the feel of Lakeside, especially if you get a few Essex lasses and crates of lager in, grow a huge beer belly and try to sweat as much as you possibly can. The control system itself allows for a better multiplayer than single player experience as well. The AI feels somewhat arbitrary, but when you’re against a mate it’s easier to feel like this is a game of skill rather than chance. Similarly, while the load times are excellent, and the time between shots is minimized, you’re always going to be that much more interested in the actions of a human than AI, and local multiplayer does make you feel a little more involved. It would have been worthwhile for developers O-Games to have taken a little more from past games, not to mention titles out there that cover similarly repetitive titles. Take, for example, the Tiger Woods franchise. Now, potentially, Pro Tour could have worked in some of the excellent features of that series. There’s been any number of them in the past, and it has enough left over game mechanics to furnish any videogame franchise with ideas. The control scheme you’re given at the start is a very basic one, and it doesn’t change. Target the point you wish to hit, hold the bumper to lock and release when you have judged the power correctly. It doesn’t make 180s simple, by any means, but some kind of variation would have been nice. A wobbly reticule when things get serious? A stress meter for when you need to turn things around? What about a bullet time mode for the winning shots? Look, there’s three ideas that could have been easily incorporated into the game, but no, you get the most bog-standard controls available. The same goes for every other aspect of the game. The character customisation is weak, the models pretty dreadful, and the game modes all too similar to be bothering about. The only exception to that is the pub games mode, which allows you to try your hand at things like Round-the-clock, Killer and Shangai. Great fun for the hour or two of fun (not to mention the couple of hundred gamer points) to be had, but past that unworthy of note. 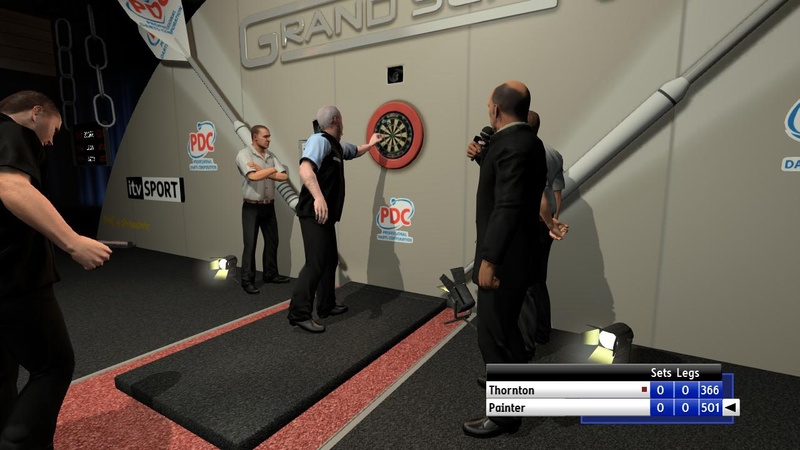 So what you have in PDC World Championship Darts Pro Tour is a decidedly lackadaisical title, with nothing really to shout, or indeed speak loudly, about. It’s not great fun, and while much of that is down to the developer’s rather turgid take on the game, they can’t take all the blame, as darts is a tricky one to get right. So tricky, in fact that we haven’t ever played a good one. As soon as developers start looking outside the immediate frame of reference for inspiration, we might get a decent darts title, but until then, you’re stuck with this kind of tosh. I have never really condoned sport of any type on a computer. I can play football in the park, I can’t parkour assassinate a pope, for example in real life. But really, why bother emulating darts? Who on earth would want to “be” an anemic Phil Taylor on a computer game in preference to throwing some arrows in the comfort of their local pub or home? It just smacks of pointless. I had the displeasure of plating this last night, my flat mate had got it, the fool. 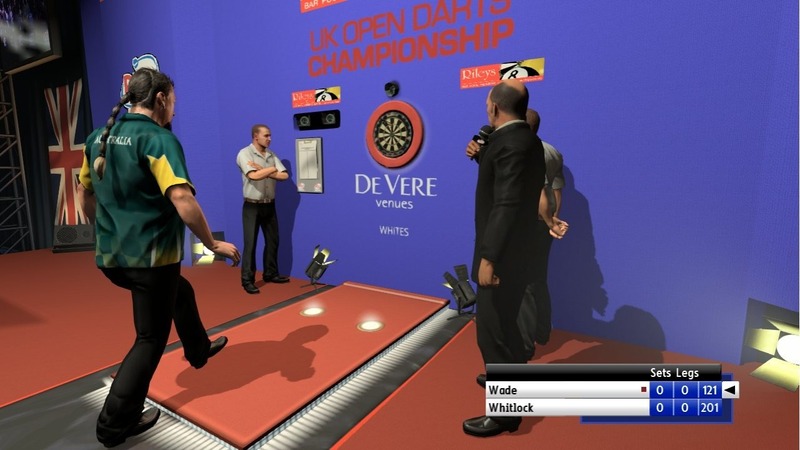 The controls create the illusion of skill in this game can be countered by droping the target a few centimeters south and full power throwing the dart at the board. This game blows. And 4/10 is generous.